Okay, so I have shared the finished product for the first communion cake made yesterday (with the priceless help of my mom!) But I thought you might be interested to see a couple pics from the process. 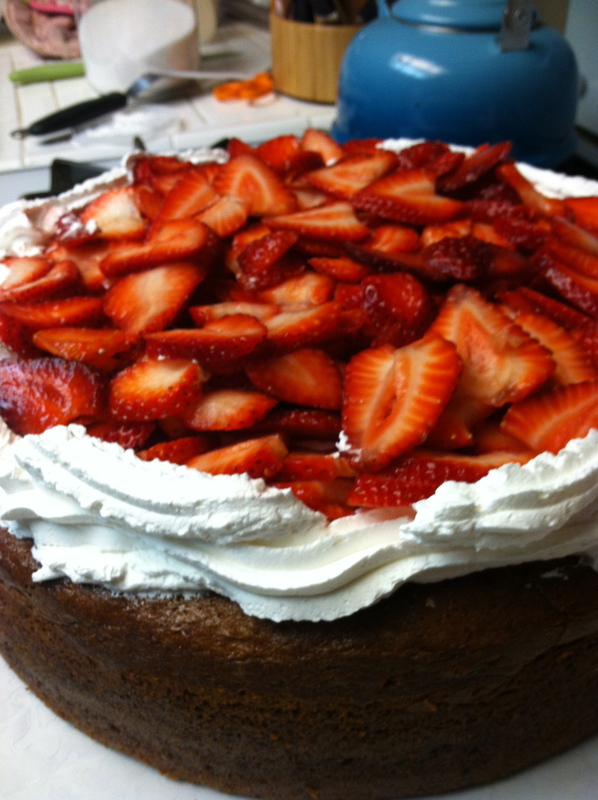 I snapped one nice shot if the strawberries all sliced up and laying in the middle waiting for the top layer of cake. I’m telling you, it’s moments like this one that make my husband very disappointed that I’m going to sell this cake instead of keeping it for us. 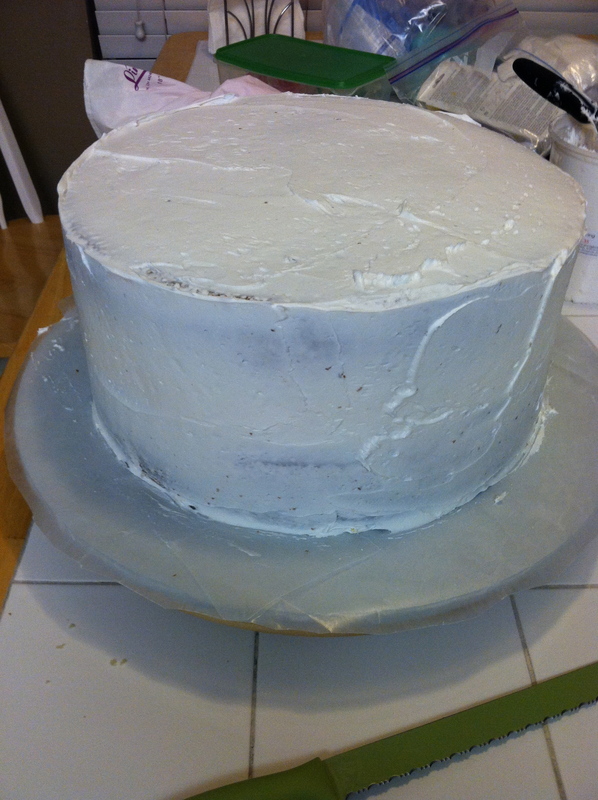 Here is a picture of the cake once I’ve had a chance to put a crumb frost on it. I have to say, I am incredibly proud of the shape of this cake. I don’t know the last time I baked a cake that was this level and had this perfect of an angle. 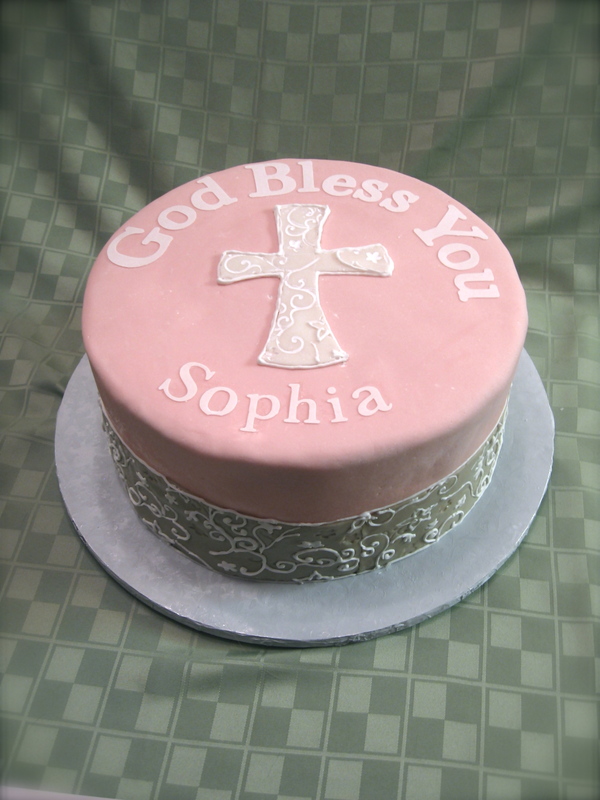 Something else notable about this cake is the pink fondant. As I’ve mentioned before, I like to make my own fondant. I have a great recipe that basically calls for marshmallows and powdered sugar. 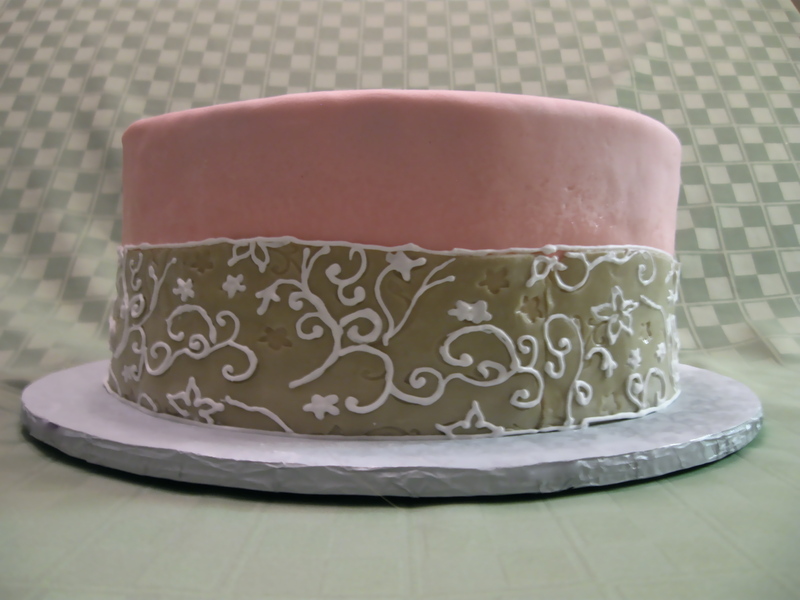 For this cake, I decided to use pink strawberry flavored marshmallows! I didn’t have to dye it and the flavor turned out great. Today I had the chance to make another cake for the same friend who hired me to make the Hollywood themed sweet sixteen cake from a couple weeks ago. She wanted the same flavors; vanilla cake with strawberries and a light whipped cream frosting. 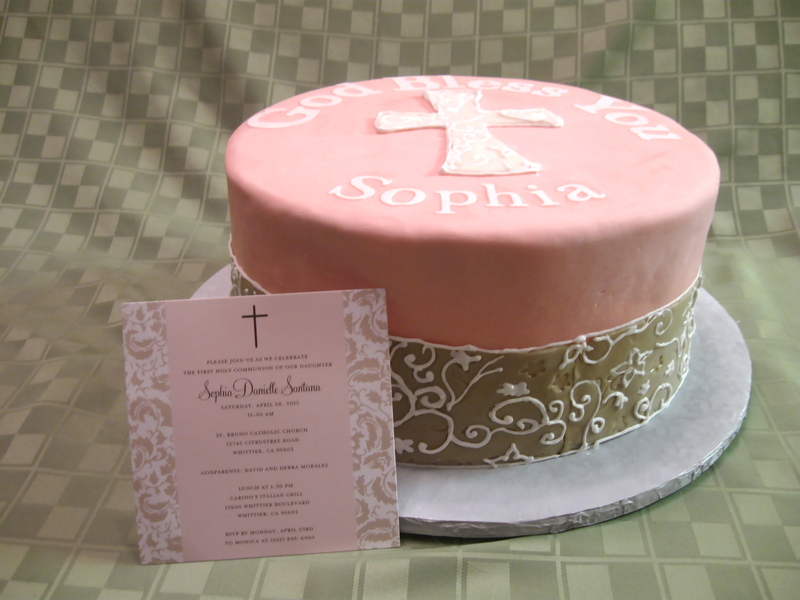 This time, the cake was for a first holy communion. 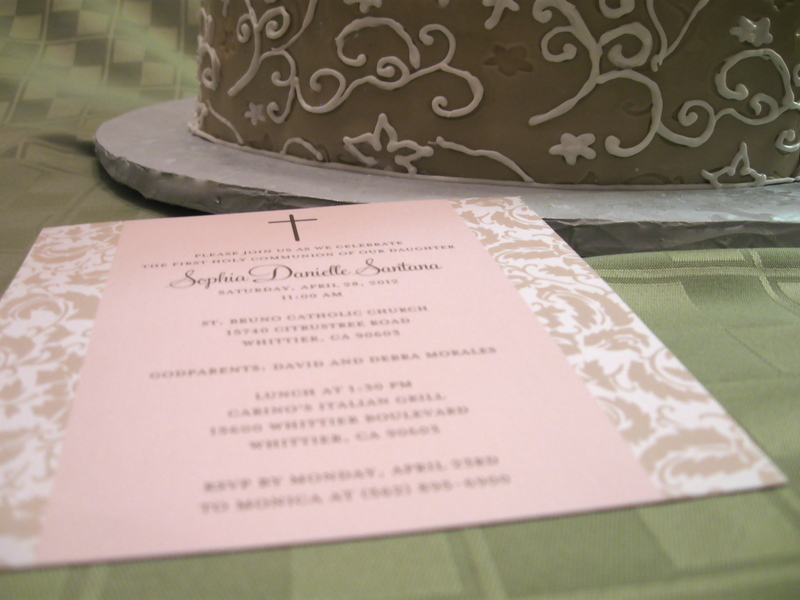 She gave me one of the invitations to base the cake design on. Help! I need input for our office re-do! Okey Dokey. I recently decided it was time to revamp our home office. I knew it was getting crowded and that it needed some major organization. My incredibly thrifty husband is very happy to use old boxes for filing and is always eager to hold on to scrap paper to use for miscellaneous printing/notes etc. I am also on the thrifty side and because of these tendencies, our office (and entire home, to be honest) is a bit of a modge-podge collection of hand-me-downs and yard sale finds. Not to speak ill of yard sales! Some of my favorite pieces are yard sale finds. But our office was looking too much like we are still in college. 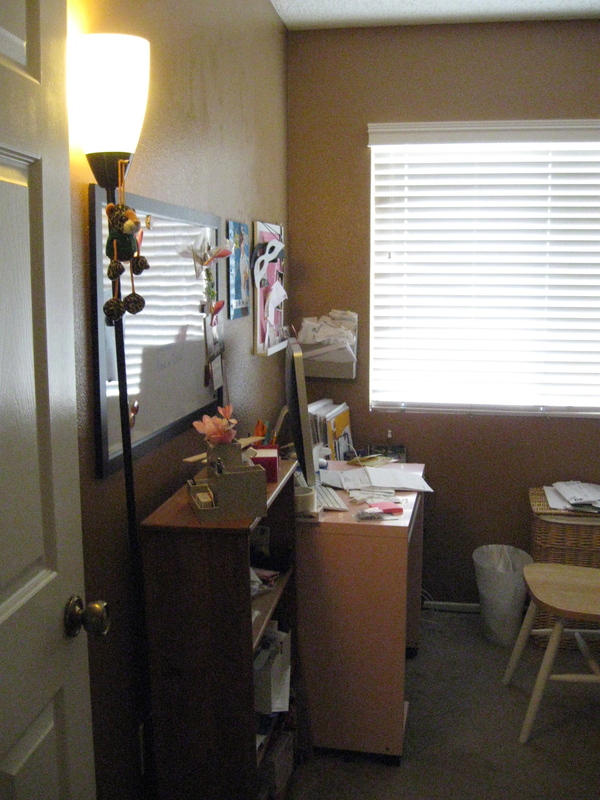 I decided that since we’re pretty much “grown-ups” sometimes, we should have a home office that reflects that fact. And, since I’m always looking for opportunities to be creative, I decided it was time to take it on. I started this project a couple weeks ago when I redid our closet. 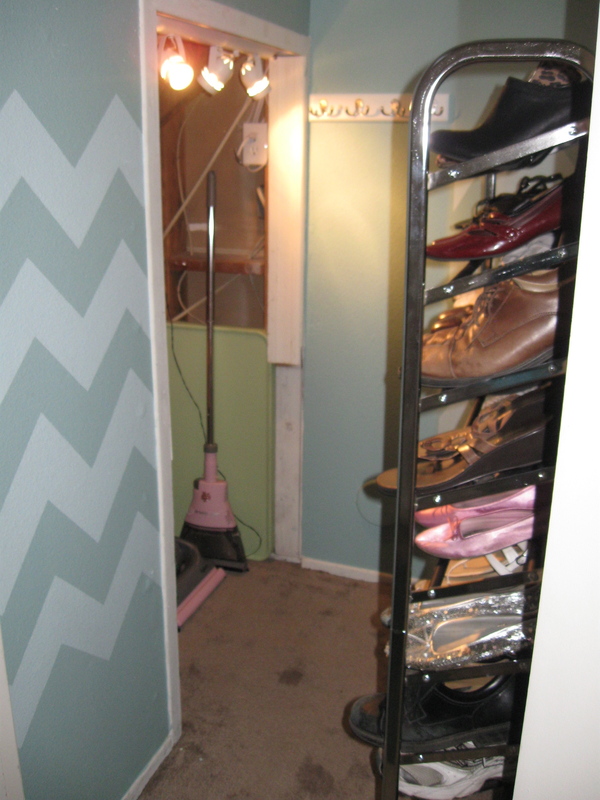 The closet was a test run for the chevron stripes I had planned for the office. I was really pleased with the way they turned out, so I was eager to start the office. For the last several days, I have been living in complete awe of how much stuff we had packed into our office. With it spread out in the living room, I wondered how it had all fit in one little room!!! But then I took a look at the office before photos above, and was put to shame. I can’t believe how messy that room was! 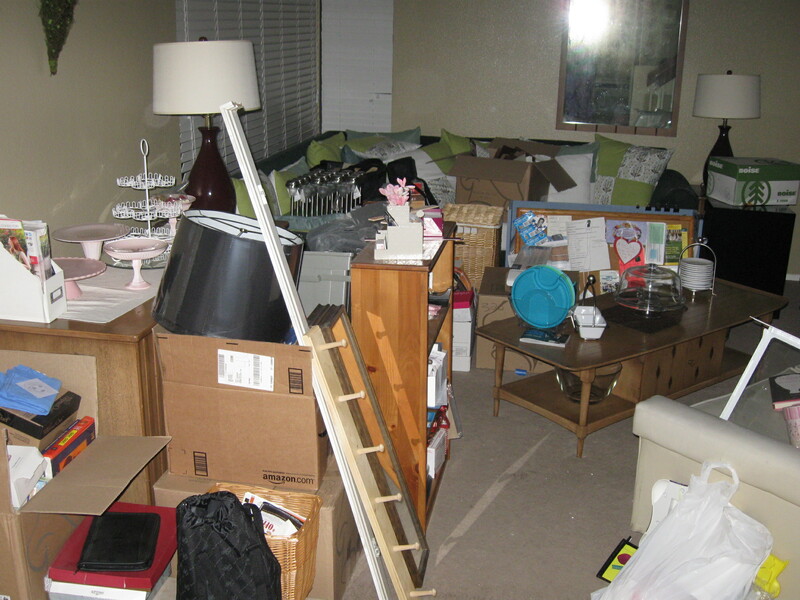 Actually, after looking back at those before shots, I can see how all this stuff is taking up our entire living room. How embarrassing! Once the room was “gutted” we got to work. 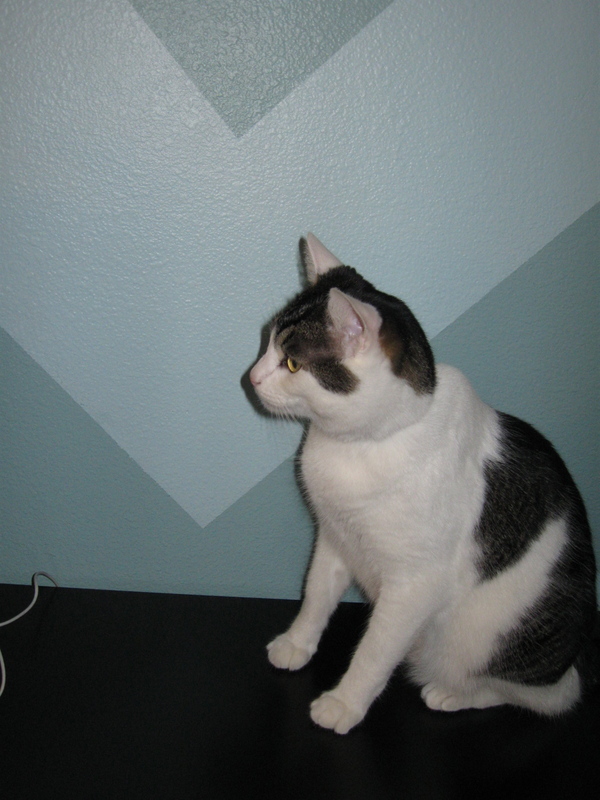 I did my chevron striped wall. DH helped with the plain walls. And we started building new desks. The desktops were $10 each in the as-is section if Ikea. 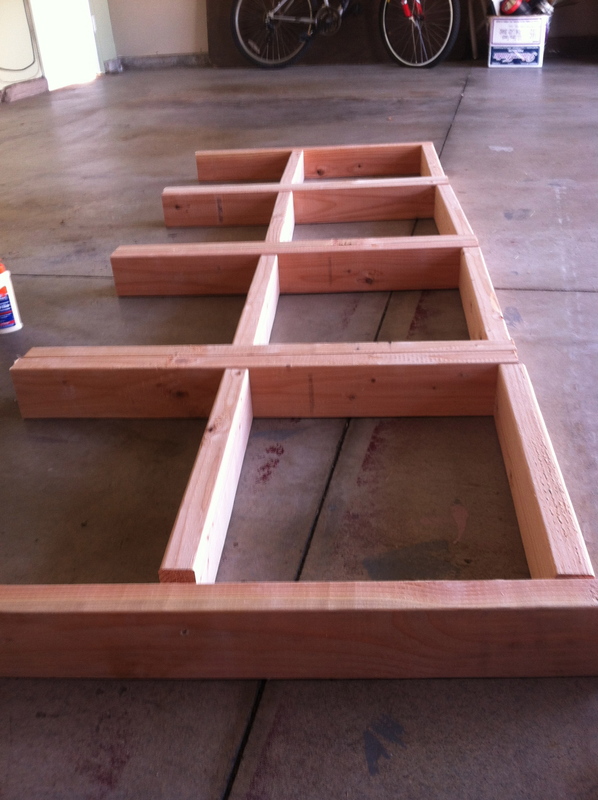 We bought some 2×4’s and built frames. I broke two drill bits before DH got home from work and rescued me the rest of the drill bits in the box. 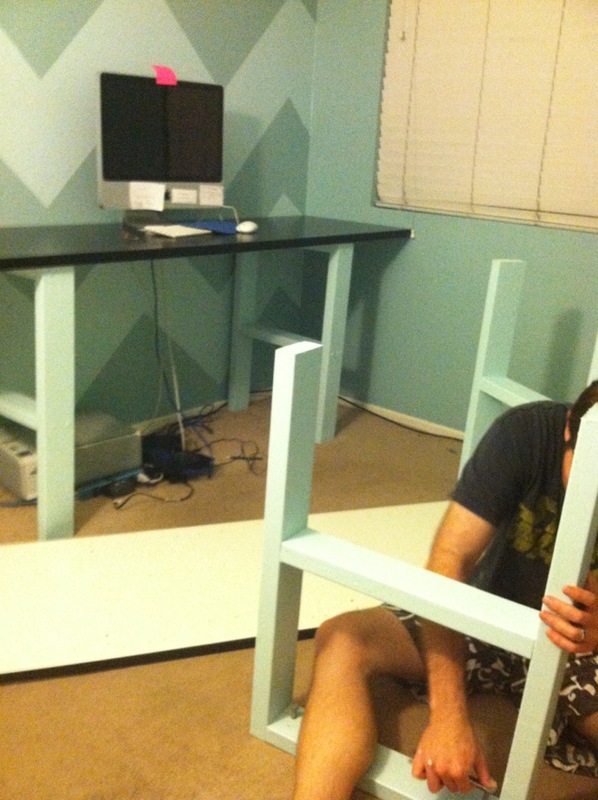 We painted the frames for the desks. And were so pleased to attach them to the desktops. They turned out great! These look A's, but not just any A. They look like the A that DJ Tanner made out of an F! We kept calling these the F-A frames. We moved DH’s old desk (which was a hand-me-down from one of his sisters, I believe) into the closet for a perfect fit. 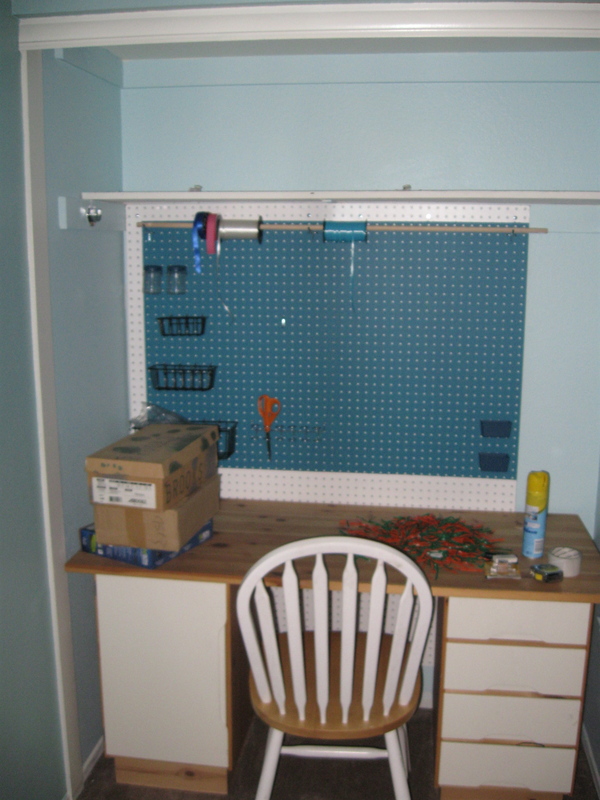 We put up some peg board in the back wall of the closet and now it’s ready to be a craft station. The new desks in the office are going to be used for more businessy type work – computer and paper work type stuff, not mess glitter and paints. I can't wait to get all my arts and crafts stuff organized here. Currently, it's all stored in random little clusters throughout our house! So, now we have to finish. We had thought we might put the two bookcases (that are both freshly painted) back into the office. But they just don’t work. I would be open to a long and short book case along the empty wall, but I’m not sure. 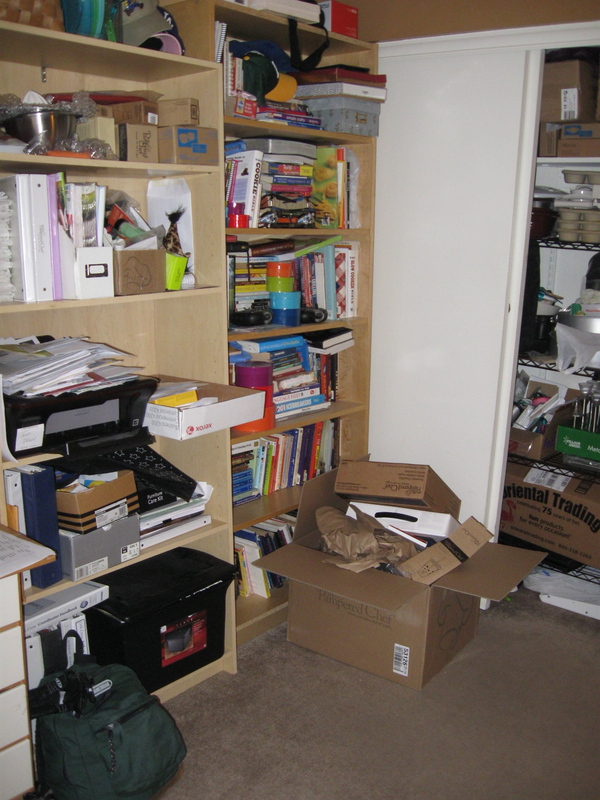 In the photo, you can see that we tipped one of the bookcases on it’s side to get a feel for that layout. I think it might work okay. We also have thought about getting one really tall and narrow bookcase to go against that little corner. 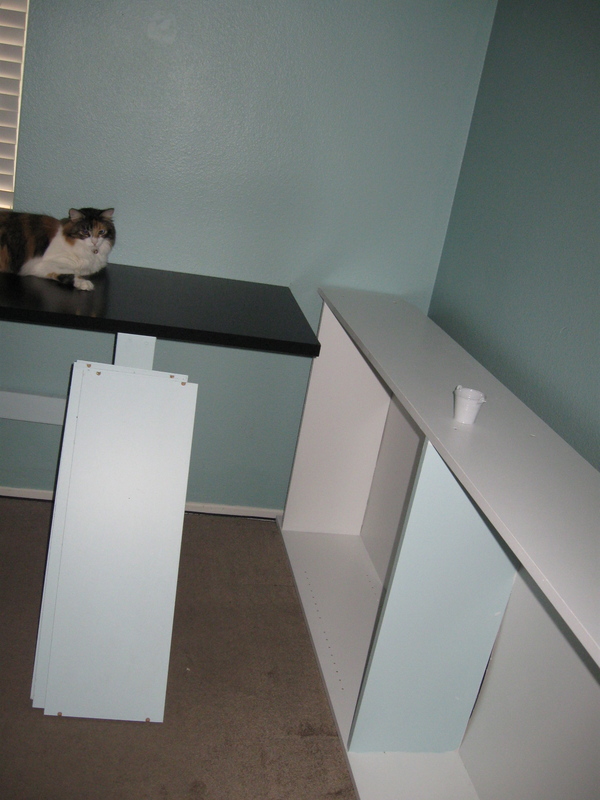 The space between the end of the new desk and the corner is just under 18 inches. I found this bookcase from Ikea that might work. I’m not sure if I would go with the white, black-brown, or birch. This is Troy. He thinks this whole office makeover is for him. He approves of the new desks, but not of the mess in the family room. So, what are your thoughts? What do you suggest we do to finish our office? What would you add to the empty wall for storage and to the corner so the desk ending doesn’t look too funny? We have an amazingly spacious downstairs closet with far more storage space in it than the entire backhouse had that we lived in when we first got married. It is so wonderful and definitely one of the many things we love about our home. But, we weren’t exactly using the space very efficiently. 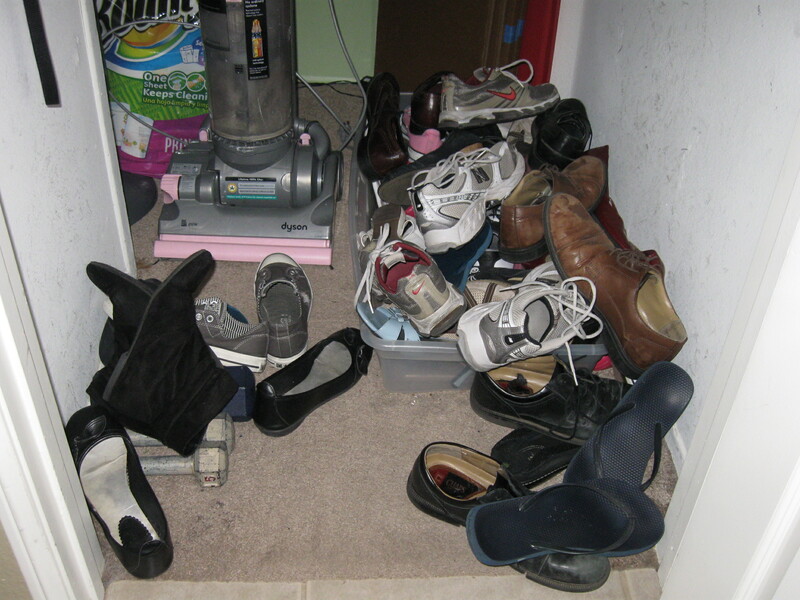 It is the home of all our shoes. 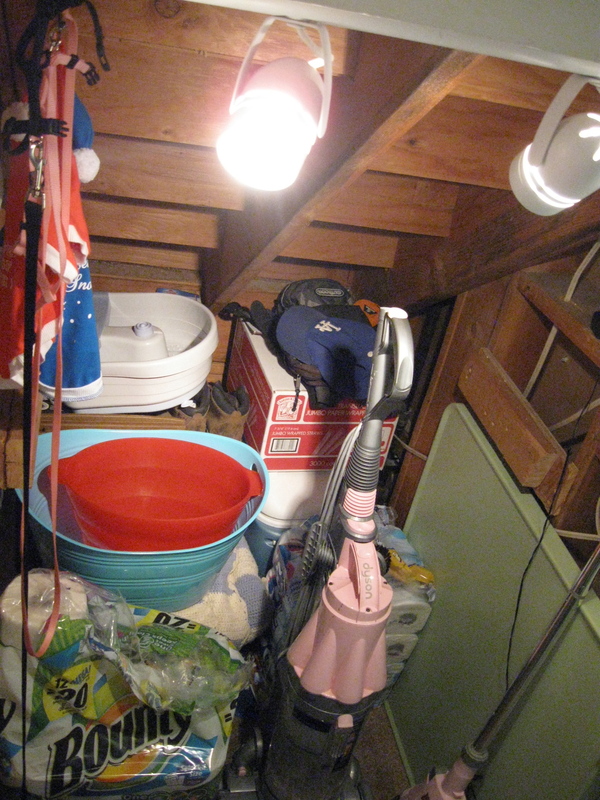 The space under the stairs, at the back of the closet, stores things like camping supplies and toilet paper and paper towels that we buy in bulk. We regularly had to climb over all our shoes to get the vacuum out and many of our shoes were getting beaten-up from being stored in a Tupperware box. 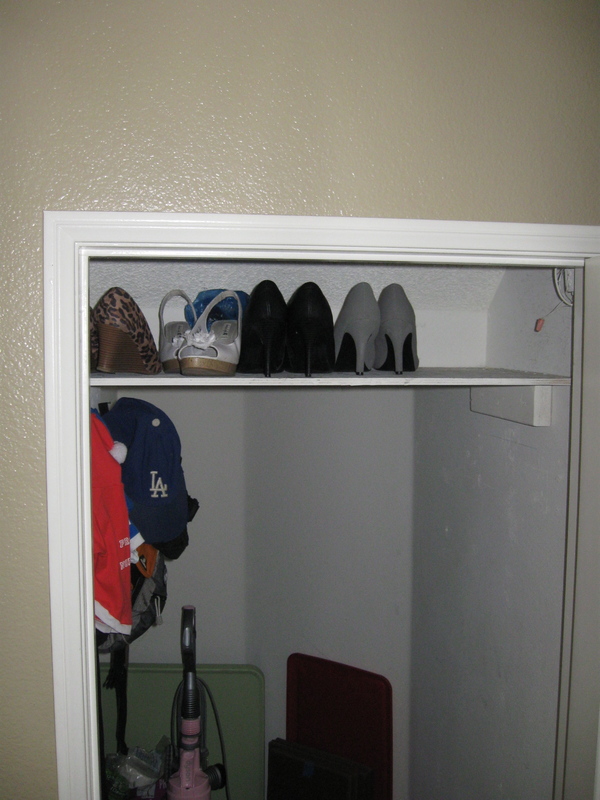 I got fed up and decided it was time for a closet makeover. 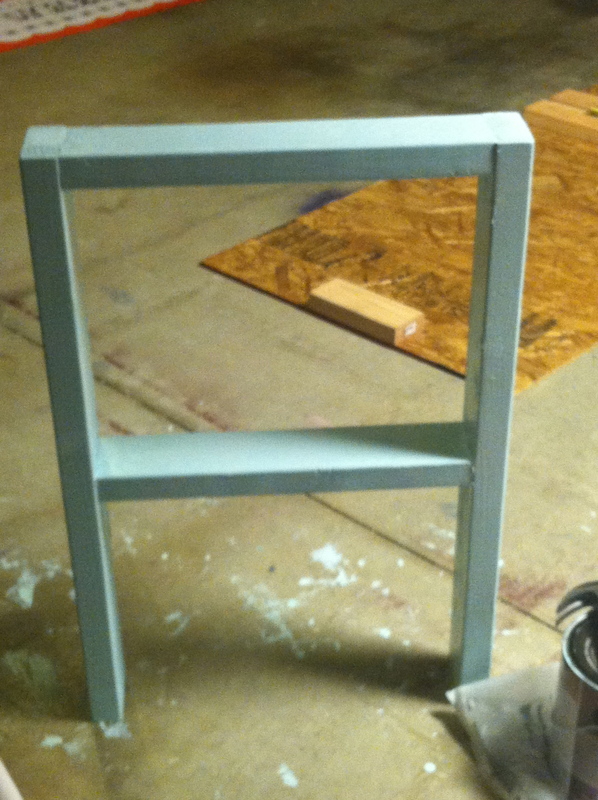 I started by painting a base coat with a creamy shade of bluish teal that I found in the Martha Stewart line. 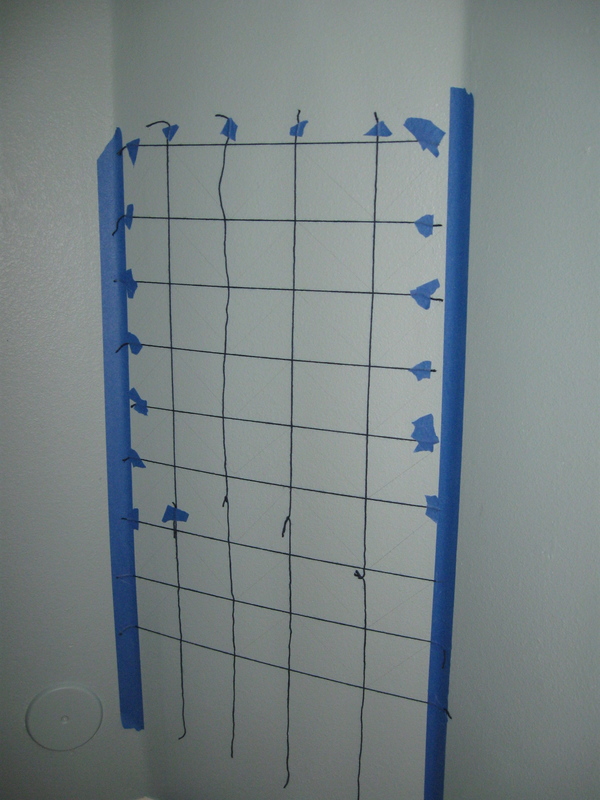 Once that had completely dried, I made a grid by hanging yarn, and drew out my stripes. If you look closely, you can see my pencil marks. 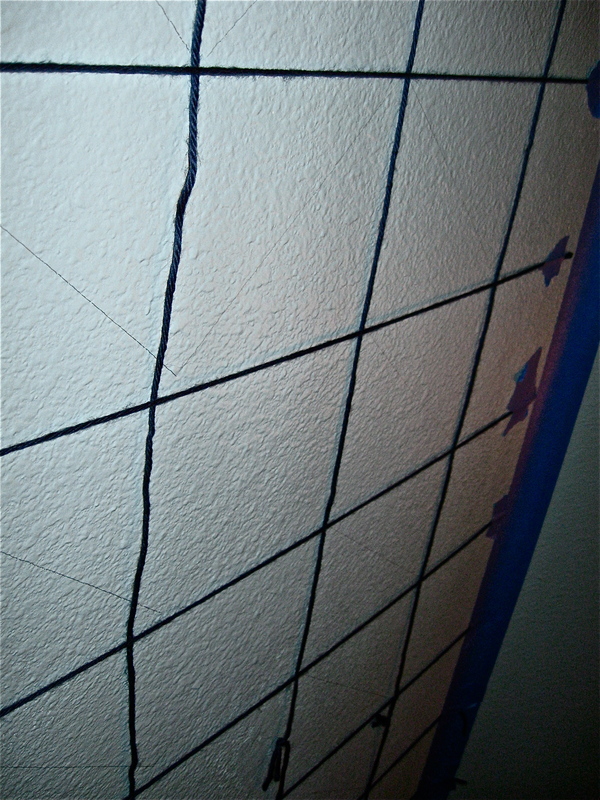 After my stripes were drawn, I removed the yarn, taped them off and painted the stripes in a lighter shade of blue. The chevron stripes are not complicated to make, but they are a bit time (and tape) consuming. 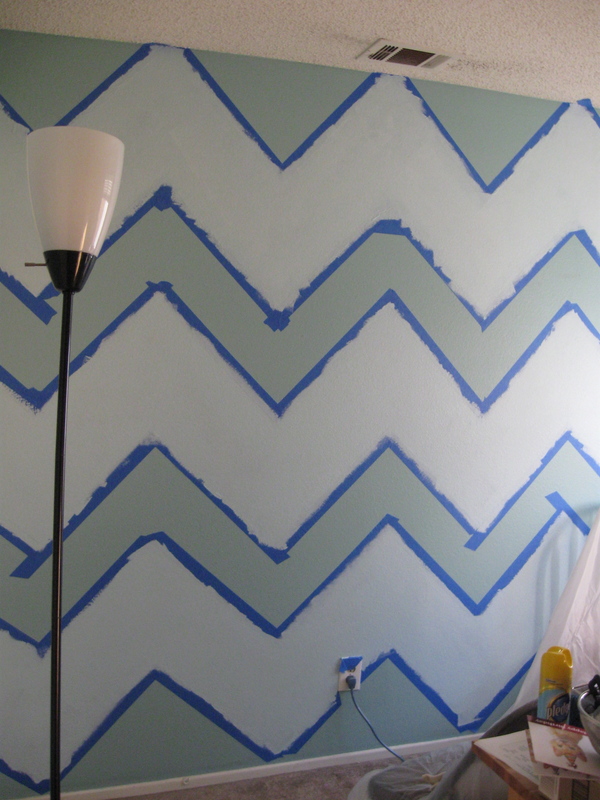 Once the paint had dried for about an hour and a half, I removed the tape to find beautiful, clean chevron stripes. 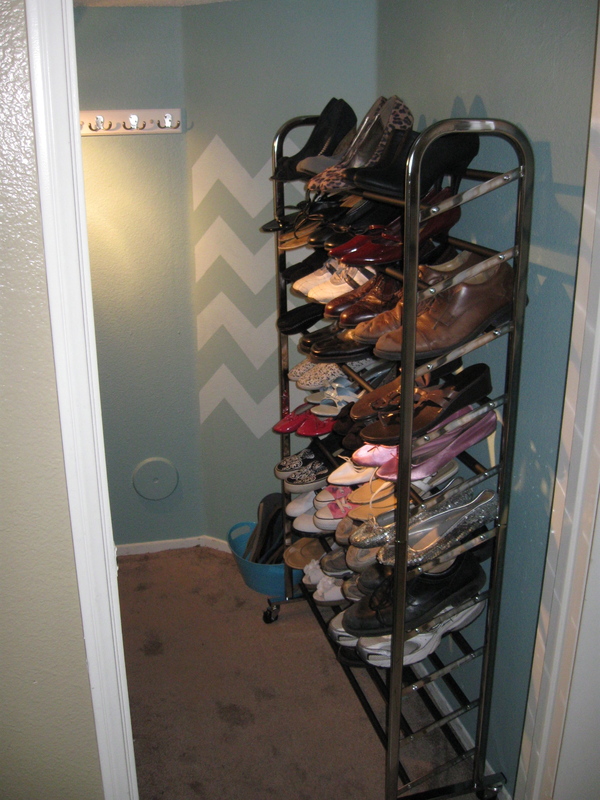 I also found a great, 50 pair shoe rack at Target. We shopped around and found a light at Home Depot to hang in the back doorway. We had to have an electritian come and install a plug in the closet. Turns out the electrical outlet wasn’t too complicated to add because there was a kitchen outlet on the other side of that wall. DH installed that light and the coat hooks you can see on the back wall. 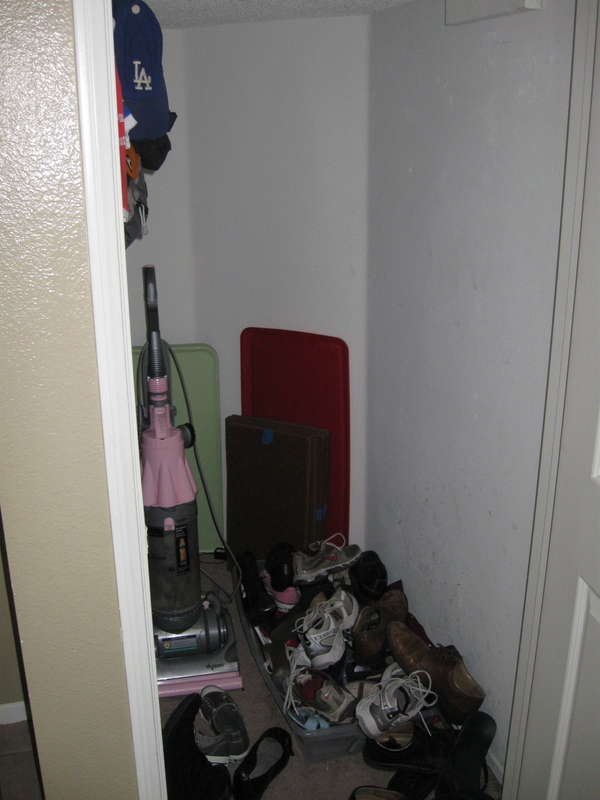 Now, we have a beautiful, well-organized, well-lit, useful and efficient downstairs closet. I love it! 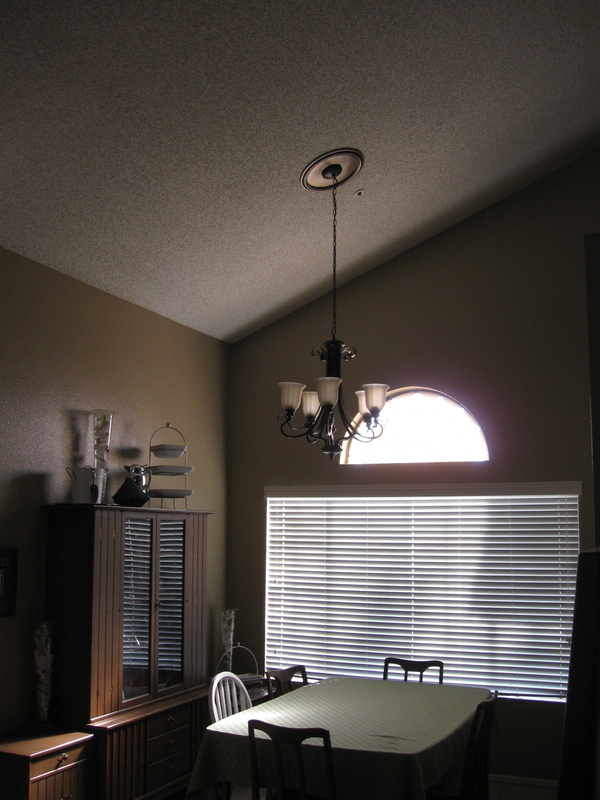 On a side note, we also had a new chandelier installed in our dining room that I am so thrilled about! This weekend was our church’s 10th anniversary celebration, or rather CELEBRAT10N. 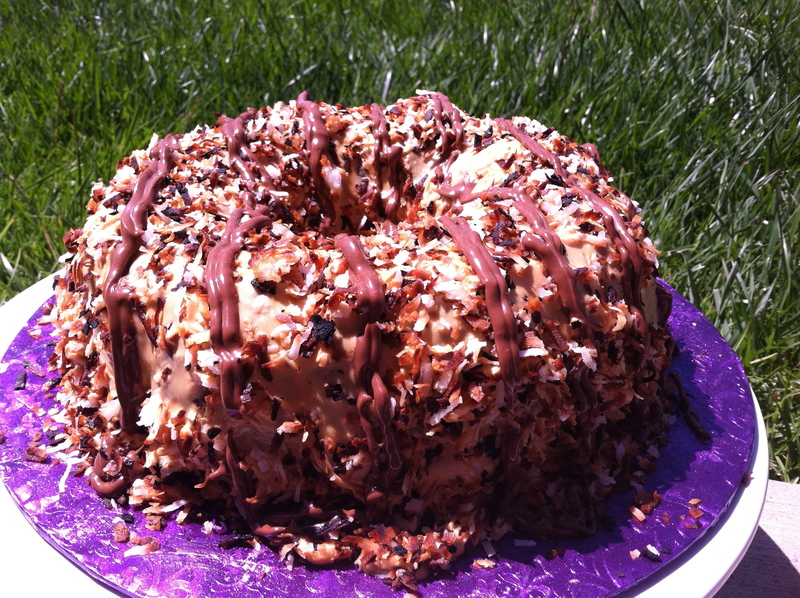 My friend Kristin who has made cakes with me before suggested we offer to make the cake for the party. We were given the colors of the party, which were red, blue and yellow, and the count for the event which was about 150. Other than that, we pretty much had creative freedom. We came up with the idea of making the cake look like a sky with pennant banners hanging outside with lots of balloons escaping. We cut out letters spelling the word CELEBRAT10N – notice the use of a one and a zero instead of the letters io at the end there… Very cute idea that was not ours. After about 28 hours of work split between three people, Kristin, my incredibly generous mom, and myself, we finished the cake. DH and I moved the cake to the car on Friday night, and we went to bed. I was totally pooped and looked forward to sleeping in on Saturday morning. But I woke-up at about 6:00 am feeling unsettled about the cake. I thought it was irrational and that I was just being paranoid. So I tried to put it out of my mind. 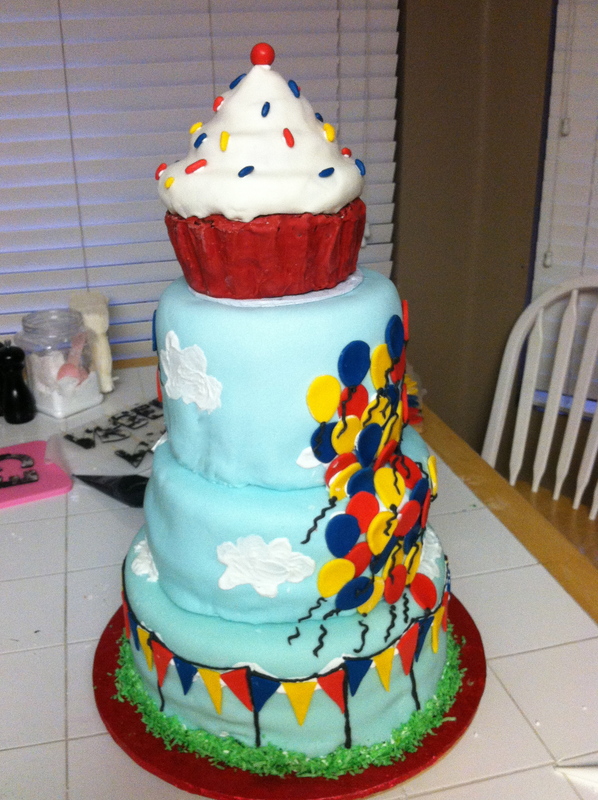 But by 6:30, I decided to just go check on the cake to make sure… so that I could rest. Well, I wasn’t being irrational after all. 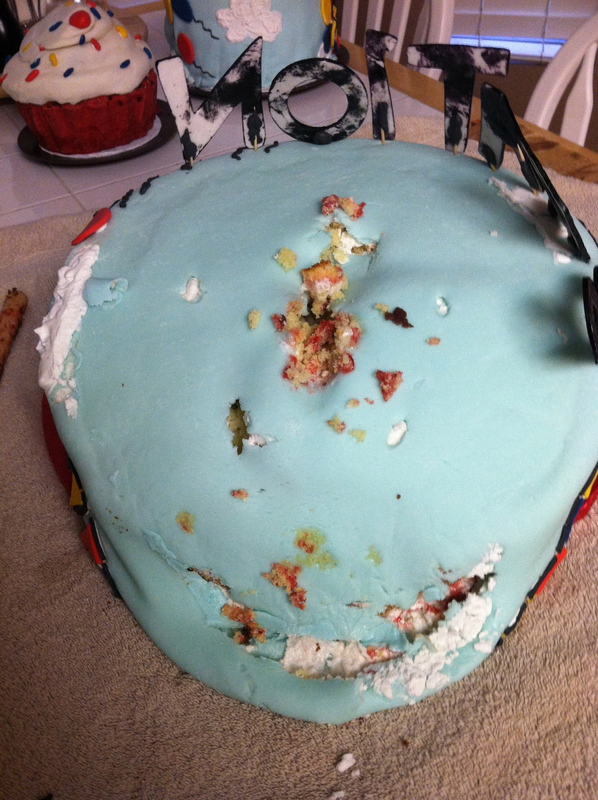 The cake had in fact, fallen over in the back of our car. I was too upset to take a picture of the carnage. But we brought all the tiers back onto the house and evaluated the damage. 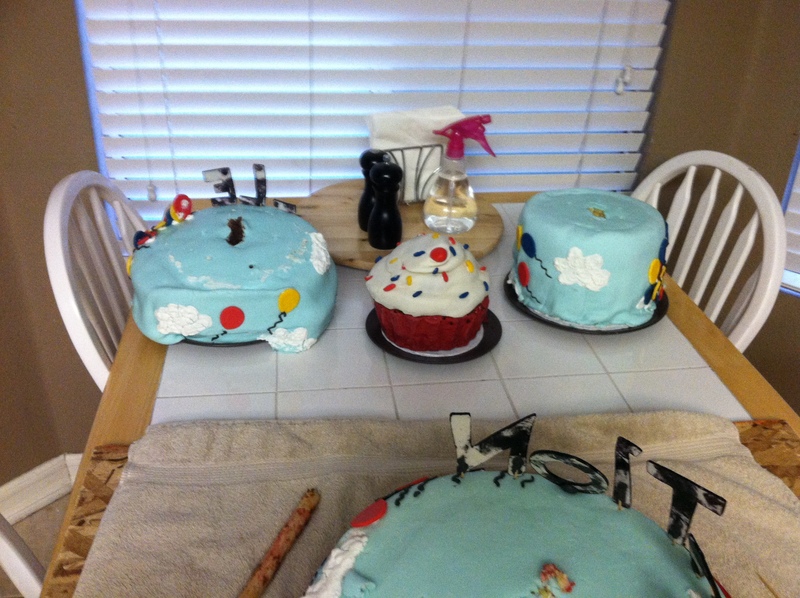 I determined that the top two tiers could be salvaged, but the bottom two needed to be redone from the beginning. 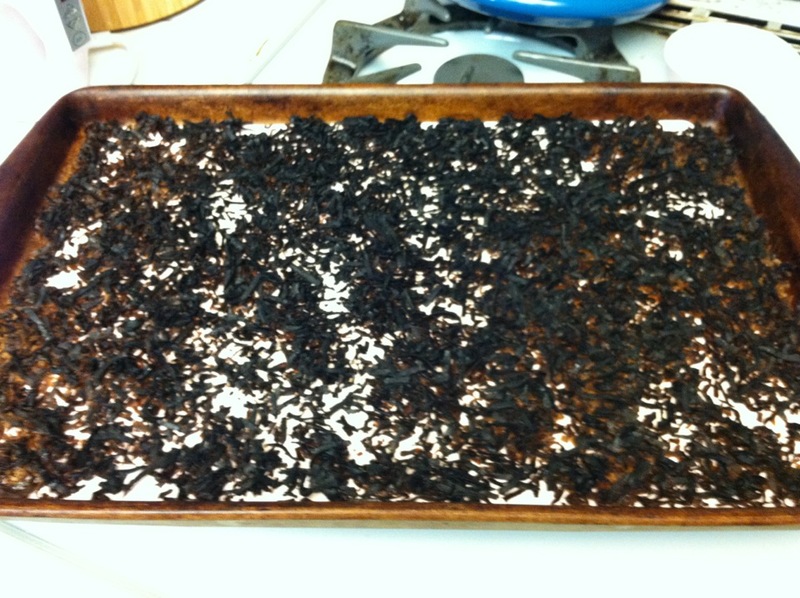 I got the first layer of the 12 inch tier in the oven and then texted Kristin to let her know. And then called my mom to let her know, too. On the phone, I broke down (again). We came up with a game plan. Within an hour, I had the second layer of the 12 inch cake out of the oven. We had a plan for the new 10 inch cake. Kristin came over, DH had gone to the store to buy ingredients for more frosting and more fondant. We had the ball rolling. By 11:00 am, we had new 12 and 10 inch cakes and everything we needed to rebuild the cake. Luckily, everything went smoothly. We ended up having a pretty good time, as a matter of fact! AND, to top it off, we felt like the new cake even looked better. We were able to take it to the church and be done with it by about 4:00 in the afternoon. We even had time for a nap! 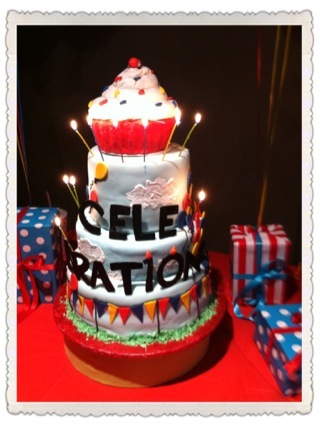 The party was a blast, the cake was a hit, and, most important, it tasted great! 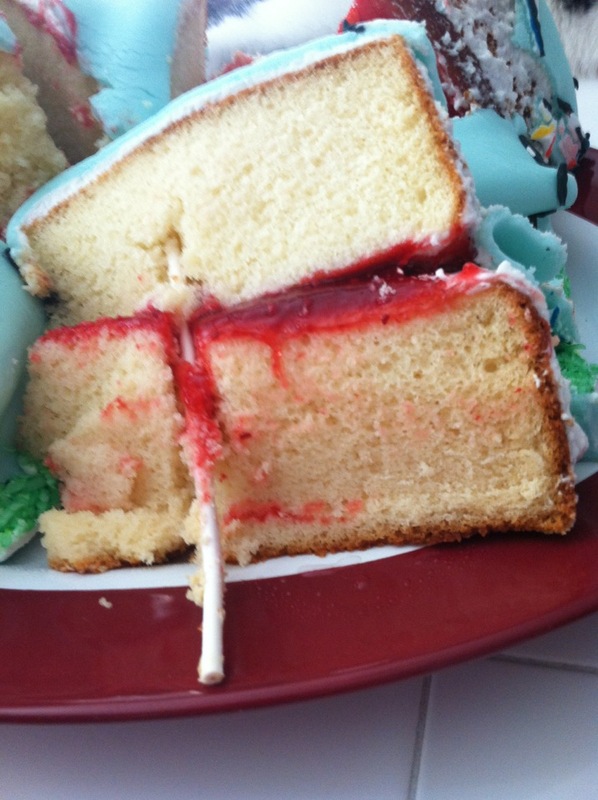 Plus, I learned a LOT about cake structure and how to avoid this in the future!